Two trends that are already well underway – the decline of Christians and the growth of religiously unaffiliated people as a share of the U.S. population – are expected to continue in the decades ahead, according to the Pew Research Center’s projections of major religious groups around the world. But, if current demographic trends hold, there also will be other significant changes in the U.S. religious landscape: Judaism will no longer be the largest non-Christian religion in the country and, by 2050, Muslims are projected to be more numerous in the U.S. than people who identify as Jewish on the basis of religion. Due in part to their continued migration into the country, Muslims are forecast to make up 2.1% of the U.S. population in 2050, up from 0.9% in 2010. Two other major factors are driving Muslim growth: They currently have the highest fertility rate and the youngest median age of any major religious group in the U.S.
People who identify their religion as Jewish in surveys are projected to decline from an estimated 1.8% of the U.S. population in 2010 to 1.4% in 2050. The median age of U.S. Jews as of 2010 (41) was 17 years older than the median age for Muslims (24), while Jews, on average, have 1.9 children per woman compared with 2.8 for U.S. Muslims. A 2013 Pew Research survey found that more than one-in-five U.S. Jewish adults (22%) say they are atheist, agnostic or nothing in particular, but still consider themselves Jewish. For the purposes of the projections, these “cultural” or “ethnic” Jews are categorized as unaffiliated and not included in the Jewish population. If the projected Jewish numbers were expanded to include cultural or ethnic Jews, it is possible that the Jews (more broadly defined) might still outnumber Muslims in 2050. In any case, Muslims are not the only American religious minority that is growing. Hindus, who make up another relatively young group that continues to be boosted by migration, are projected to double as a share of the U.S. population, from 0.6% in 2010 to 1.2% in 2050. Similar factors account for the modest expected rise in the share of Buddhists (from 1.2% to 1.4%). Two other relatively small groups also are expected to grow. 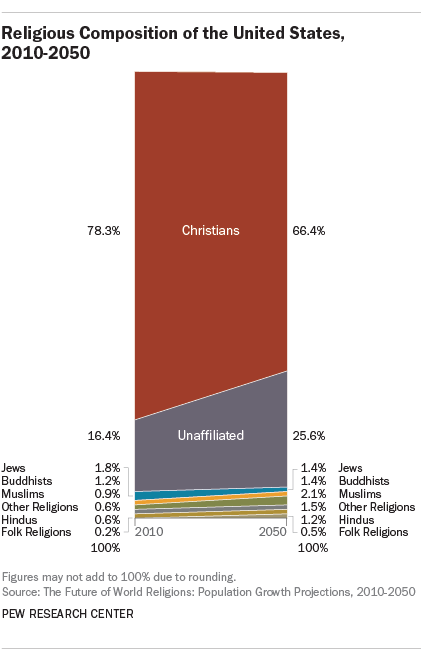 Members of “other religions” (a category for all those not categorized elsewhere in the projections, including Sikhs, Wiccans and Unitarian Universalists) are projected to increase from 0.6% of the U.S. population in 2010 to 1.5% in 2050, while adherents of folk religions are forecast to increase from 0.2% to 0.5%. Religious switching into these categories, observed in recent surveys, accounts for some of the increases. Altogether, minority religious groups – that is, everyone other than Christians and the unaffiliated – are expected to grow from roughly 5% of Americans in 2010 to about 8% in 2050.